Sound in Silence always seems to come up with interesting releases (making it one of my favorite labels of late) and this one by Amp is certainly a pleasure. For those not familiar with the Amp project, it is the electronic/post rock duo of Richard F. Walker (aka Richard Amp) and Karine Charff, based in London, UK. Amp's lineup has changed numerous times over the years since its inception by Walker in 1992. Prior to that Walker was a member of a band in Bristol called The Secret Garden that incubated a number of groups including Flying Saucer Attack and Third Eye Foundation. Amp's permutations and collaboration members (not to mention its discography) could fill a page, but you can find that information elsewhere. Having no prior acquaintance with Amp I took a brief tour through their discography to get a sense of what they're about and a feel for their evolution over time. Pieces ranged from droney-experimental and sometimes noise-based to exhibiting some [traditional] song structure, albeit somewhat loose. Rhythm was sometimes present, sometimes not. Vocals (where present) were often swathed in reverb and echo making them another hazy ambient element, some with lyrics, others wordless. While most of the instrumental elements are electronic, and keyboard based, guitar and other instruments were sometimes employed. Sometimes the motif is noisy shoegazer, ala My Bloody Valentine. Within the confines of their oeuvre there seems to be a fair amount of variety, although the drone and shoegaze formats remain constant. Nothing ever approaches anything even remotely mainstream; their improvisatory nature precludes that. While a good number of their past works often feature the experimental and avant-garde, 'Entangled Time' is relatively straightforward and set with little deviation from its structure. Gauzy, gossamer drones and pads are employed throughout the five tracks in 43 minutes that comprises this album. Charff's ethereal vocals float over, under, around and through this haze like a shimmering, elegant thread in a sonic tapestry. Rhythm is used sparingly (on two tracks only - "Will-Oh Dreams," and "Will-Oh Dreams Extended Mix") and is minimal. While some might say that rhythm in predominantly ambient music of this type is just a distraction, I think it adds to the hypnotic effect. Karine's deliciously dreamy Ophelia-like voice is not omnipresent but when it does appear, it adds dimension and depth that makes this work a standout in the realm of ambient. While not breaking any new ground here, Amp solidified its approach and trimmed the rough edges often found in their previous efforts. A worthy album, limited to 200 handmade and hand-numbered collectible copies, the like of which Sound In Silence is typically known for. A journey on the darker end of the ambient-electronic spectrum, with segues into downtempo and techno, but always firmly into the realm of ambient atmospherics. The opening track, "Gardens at Impossible Distances" drifts into eerie ambient with darker, yet majestic and spacious sounds with layers of human voice, perhaps synthetic, that instill a kind of ghostly quality -- sort of eerie, yet majestic. The eeriness dissipates in the following "Kobalt", a downtempo electronic track that skirts Oxygene-era Jean-Michel-Jarre where beats and slow melody interplay. "Last Practitioner of the Vanishing Technique" and title track, "Quadrate Patterns" starts off with drones that ricochet, and semi orchestral sweeps before it ventures into understated beats with squelching acid techno accents and layers of techno melodies that pick up as the track progresses and are catchy--an unexpected turn for something that feels more on the ambient tip. "Lost Memories" and "A Soul The Same" has a vast, cavernous feel, early 80's Vangelis, specifically the Bladerunner soundtrack for when Roy Batty meets and dispatches his maker. Human voice, understated rhythms and dirge-like tones with sombre piano notes in cohesion lend dark overtone. The overall feel of this album is slightly retro electro-ambient that Audraulic is able to conjure and deploy to powerful effect. The aptly titled "Mountains in the Sky" bookends Quadrate Patterns with deep sound yet offers a more optimistic overtone. Ambient is really where Audraulic excels best, but even the most rhythmic track here is saturated in atmosphere and brings cohesion. 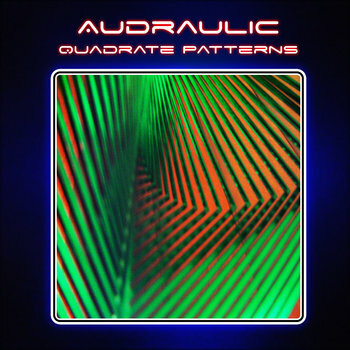 Audraulic delivers magnificent, moving ambient and with orchestral majesty and sweeps...the last track the musical equivalent of a sunrise.